TOPFFY Bluetooth Smart Watch Touchscreen Waterproof Sport Wrist Watch Smartwatch with Camera SIM Card Slot for Men Women Kids,can dial via sim card or Bluetooth optional, has many functions like: Incoming message and call remind, Pedometer, Calories Calculation, Sedentary remind, Sleep monitoring, Remote photos, Music playing, Alarm clock, Anti-lost, Voice Recorder and so on. All function can be used for Android phones,and only some partial functions can be used for iPhone,please read the Function Chart carefully!  ANDROID AND IOS PHONES COMPATIBLE - This smart watch is compatible with all Bluetooth enabled smartphones including Android and IOS phones. IOS phones such as iPhone X/8/8 Plus/7/7 Plus/6/6 Plus/6s/5/5s/SE; Android phones such as Samsung Galaxy S8/S8 Plus/S7/ S7 Edge/S6/S6 Edge/S5/S4/S3, Samsung Note 5/4/3/2, SONY, HTC, Huawei, Xiaomi, ZTE, Lenovo, OPPO,LG smart phones.  MULTIFUNCATION BLUETOOTH SMART WATCH - Dial via watch SIM or Bluetooth optional,Pedometer,Calories Calculation,Sedentary remind,Sleep monitoring,Remote photos,Music playing,Alarm clock,Two-way anti lost remind,voice recorder,multi-timezone,muti-language,daylight saving time and notification push including facebook,twitter, email,calls,texts,etc.Note: all function can be used for Android phones,and only some partial functions can be used for iPhone,please read the Function Chart carefully!  DURABLE AND COMFORTABLE WATERPROOF SMART WATCH - Stainless steel surface, Precision laminating process,Anti-sweat Nano TPU85 material watch strap, very light-weighted to wear, and the soft watch strap is comfortable to wear. Unique waterproof design, good for outdoor activity.  2PCS HIGH CAPACITY AND DUARBLE BATTERIES INCLUDED - This smart watch set includes 2pcs rechargeable lithium batteries with 350mAh high capacity and average using time of each battery is 2 days. USB cable is also included. 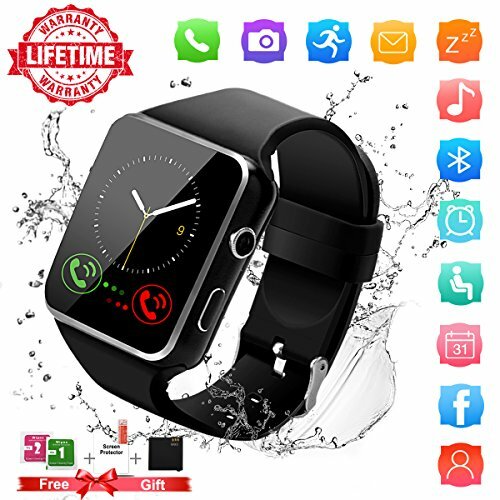  SMART GIFT FOR YOU,YOUR LOVERS AND YOUR FAMILY - This fashion and multifunctional smart watch,very easy and durable to use, it's suitable for any age people even your children and the elderly. We will offer you Lifetime Warranty of our Bluetooth smart watch, so just purchase it without any worries. Our Bluetooth smartwatch is a good gift for you,your family and your friends! If you have any questions about this product by Topffy, contact us by completing and submitting the form below. If you are looking for a specif part number, please include it with your message.